A happy weekend to everyone! It’s almost the end of the month and we want to end July with some fireworks! It will be like a 4-day, 4th of July celebration! We’re having an End-Month-Sale on all our beading patterns and tutorials! Here are some of our newest tutorials! A Mandala is a sacred form of geometric art, in the form of a repeated circular pattern, seen in many areas of art and design in the 21st century. This pendant is Teresa Morse’s version of a beaded mandala. Khéops, Swarovski, superduo, rivoli and seed beads are the components of my new project, the *Asy* earrings/pendant.Photo tutorial that explains step by step how to make the “Asy” earrings/pendant. It requires basic knowledge on the use of the khéops beads. A beautiful wire necklace created with wirewrapping technique. The tutorial is suitable to advanced students The process of making this pendant is presented in 14 easy to follow parts and illustrated with 54 pictures. 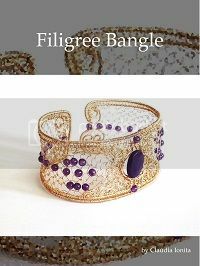 This tutorial will show you how to make this delicate filigree gilt wire bangle with amethyst beads. DY Jewelry Making Magazine #64 features tutorials using pearls. DIY Jewelry Making Magazine #56 is all about making earrings. Browse for more beading patterns and tutorials at 30% off at DIY Jewelry Making website!